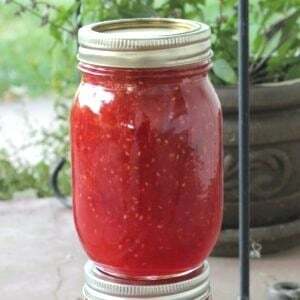 July 21, 2018 0 comments on "Raspberry Apricot Jam Canning Recipe"
I am a huge fan of raspberry jam. It is one of my favorite kinds of homemade jam. I was so excited this year that my raspberry patch finally produced enough raspberries to make some homemade raspberry jam. While looking for new jam recipes to try on Pinterest, I found a recipe for canning raspberry apricot jam, so I decided I needed to give it a try. This is a basic recipe for raspberry jam, slightly modified to replace some of the raspberries with apricots. If you don’t have the exact amount of raspberries or apricots, you can adjust the amounts of either, as long as the total amount of fruit equals 5 cups of crushed fruit. Wash raspberries and wash and chop apricots. There is no need to peel the apricots. Place all the fruit in a bowl and then gently mash with a potato masher. You should have 5 cups of crushed fruit. If you don’t have 5 cups, either remove or add some fruit so that you have 5 cups. This recipe makes about 4 pints or 8 half pints of raspberry apricot jam, so sterilize your canning jars, lids, and rings by running them through a quick rinse cycle in the dishwasher. Leave them in the dishwasher until you are ready to use them. Place the measured fruit into a large stock pot. Stir in powdered pectin. Bring to a boil that cannot be stirred down. Stir in sugar. Return to a boil that cannot be stirred down, and boil for 1 minute. Remove the pan from the heat and remove any foam off the top of the jam with a metal spoon. Fill your boiling water canner about half way with water and bring the water to a boil. Remove your jars, lids, and rings from the dishwasher. 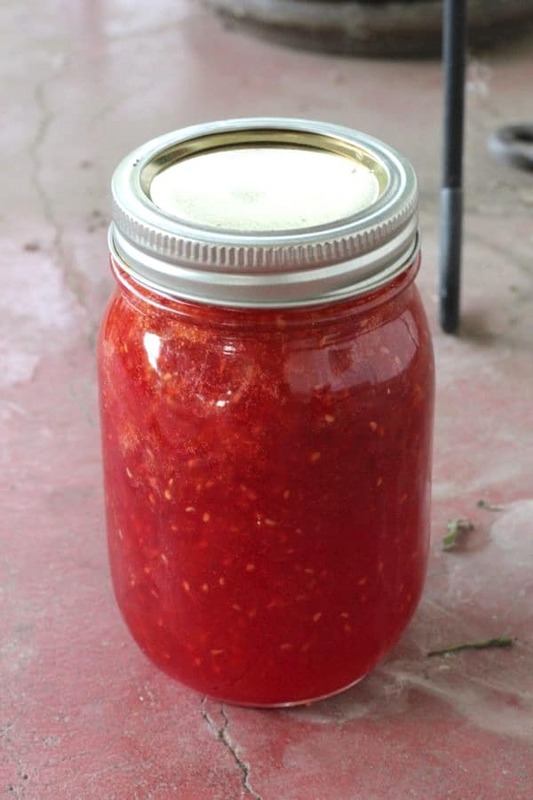 Ladle the hot jam into your sterilized canning jars, leaving 1/4 inch head space. The head space can easily be measured with this inexpensive canning funnel. Wipe the rims of the jars with a damp paper towel or dish towel. Place the lids and rings on the jars finger tight. Place the jars in the boiling water canner, making sure the jars are covered with 1 inch of water. Bring water to a boil and process jars for 10 minutes. Remove the jars from the canner and place them on a towel on the kitchen counter to cool. Let the jars sit overnight before moving them. The next day test the seals on the jars. If they are sealed the jars can be stored in a pantry for 1-2 years. Unsealed jars can be placed in the refrigerator and then eaten in the next month or two. If you are wondering how this raspberry apricot jam tastes, it is absolutely wonderful. I was very happy with how it turned out. It mostly tastes like raspberries, but the apricots give it a slightly tangy taste that is delicious.